My name is Idgie Amelia – Idgie for a character in Fried Green Tomatoes, and Amelia after Amelia Earhart, because soon after Mom brought me home from the San Francisco Humane Association, I tried to fly out the window. But I am actually a manifestation of the ancient Egyptian cat goddess, Bast. I exist on earth so that humans may worship me. 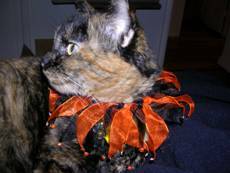 You can see how beautiful I am in my lovely ruff, which matches my gorgeous parti-colored fur. My True Egyptian Name is Ygdi, which means “The One Who Must Be Worshipped and Brushed at All Times.” You may start worshipping me now! Besides worship and brushing, I enjoy biting things, like plants and electrical wires and occasionally, when I get very excited, human fingers. I’m not much for toys, but I do like to watch my humans dangle things for me endlessly – they look so silly when they do that! As mistress of all magic, I can manifest things just by willing them. I once made a door appear in a wall, and I’m working on filling the house with chickens and lizards. Unlike most cats, I enjoy traveling on vacation. Perhaps one day I will go to Egypt and excavate my treasure from Bubastis. Then my mom won’t have to go to work every day to earn enough money to keep me in ruffs, duck-flavored cat food and airline tickets. Hello, my name is Olive Greystar. I live in the garden and never go inside. Most people would call me “feral,” but I prefer “fairy.” Life is hard for most feral cats, but I got lucky: I came with the house. Mom feeds me and takes care of me; she had me fixed so I wouldn’t have kittens. I’m not very big, only 5 pounds, but I’m a dangerous predator to lizards and crickets! Sometimes I even catch fruit rats and birds, though I prefer kibble, and I get plenty of that. I am very talkative, but I’m scared of people (except Mom! ), and I don’t like being touched or looked at. So stop looking at me right now! 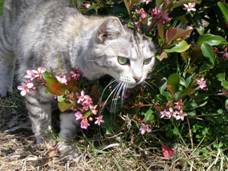 To learn more about helping feral cats in your neighborhood, please click here.